States and grows wild over much of southern Indiana. ready supply of fruit in the fall. There are many cultivars of Persimmon which exist. This yellowish orange/red fruit is native to China, but is also grown in Korea, Japan and parts of California. 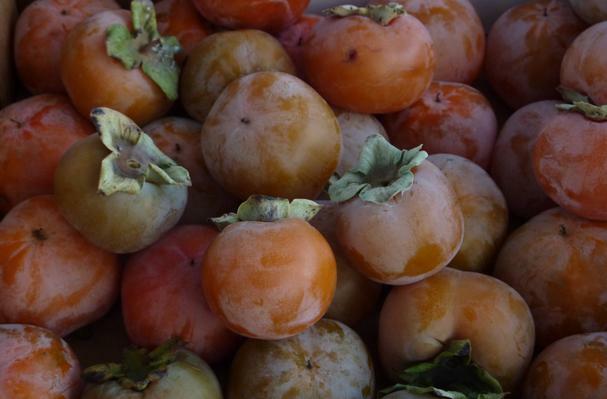 Persimmons are classified into two main categories: Astringent and Non-astringent. The astringent varieties can be eaten only when soft-ripened, while non-astringent varieties can be eaten when crisp and firm. Two of the most common persimmon varieties are Hachiya and Fuyu. Persimmons range in shape from oval to squarish, and can be deep orange or yellow in color. The only parts of the fruit that are not edible are the seeds and the calyx. The flesh can vary from mild to very sweet, similar in taste to apricots and mangoes.